The two towers will be built on the opposite sides of a highway, and linked together. 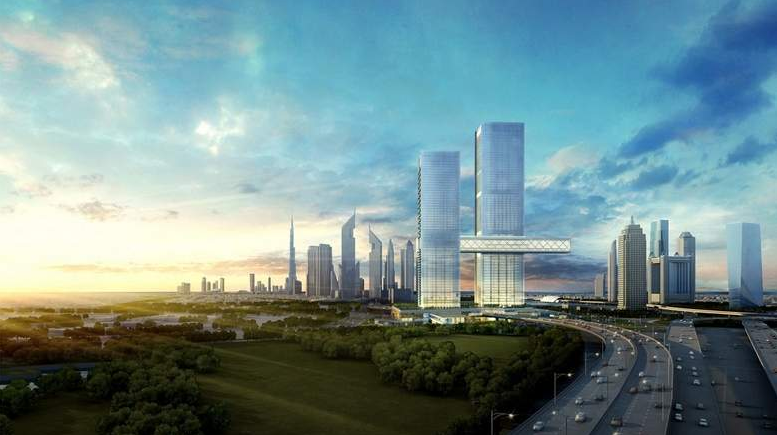 Another Dubai landmark has begun to take shape as work has commenced on the construction of a new mixed-use development. According to the developer Ithra Dubai, the real estate developer wholly owned by Investment Corporation of Dubai (ICD), One Za’abeel is mixed-use development in the heart of the city, which is due to be completed in fourth quarter of 2020. Japanese architecture firm Nikken Sekkei firm has designed the city’s new iconic towers which are connected by the world’s largest cantilever. Located in the heart of Dubai, the development — which features the address #1, Za’abeel — is strategically positioned between the old and new business districts of Dubai. One Za’abeel will rise from a two-storey podium dissected by the city’s highway. The first tower consists of 67 floors, and the second, 57 floors. Both towers rise up from a structure consisting of three levels of podium and seven levels of basement. With a total built up area of 480,000 square meters, the two towers incorporate residences, a hotel, serviced apartments, office spaces, a retail podium, known as The Gallery, and a panoramic sky concourse, The Linx, that connects the two towers of One Za’abeel. The project will have 37,000 sqm of office space, 12,000 sqm of retail, 90-key ultra luxury hotel, 314-key luxury hotel, 94 serviced apartment, 263 residential apartments and 2,500 parking spaces. Alec Engineering & Contracting was appointed as the main contractor. Site excavation, preparatory works, shoring and piling were recently completed, and the construction of a seven-floor basement is currently underway. “The project has now entered an exciting phase of construction where One Za’abeel and its panoramic 210-meter sky concourse – The Linx – will in due course re-shape the ever-exciting Dubai skyline,” said Issam Galadari, Director and CEO of Ithra Dubai.